This work is one of thirty nine drawings from Henry Moore’s poignant and highly personal 'Family Groups' series (c.1943-44) in which he portrayed parents protectively holding small children in their arms. 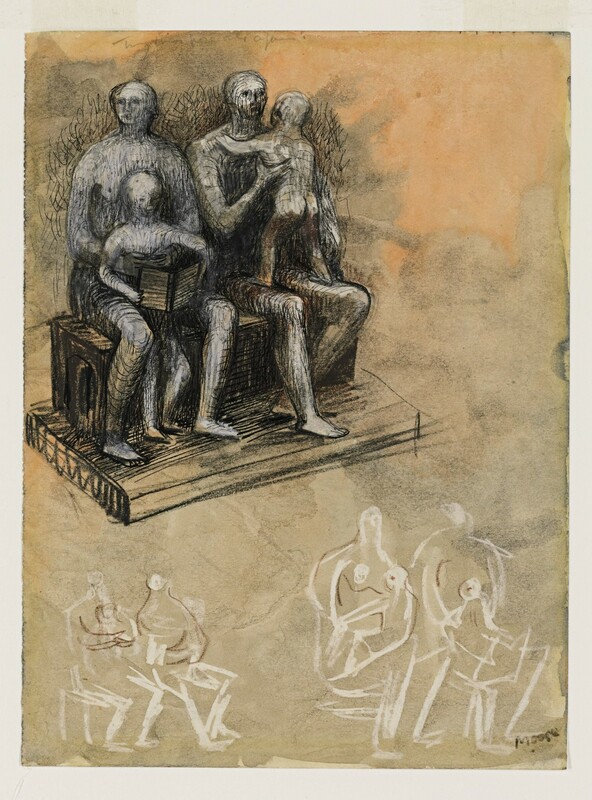 From this important group of sketches Moore created a number of maquettes on the theme, as well as his first large bronze sculpture 'Family Group' (1949). The concept of the family groups initially developed before the war when Moore was asked to create a sculpture for the Impington Village College. The school was to become a focus for families of the community and so Moore suggested the subject of a family group. Having long been fascinated with the Mother and Child motif, “the idea of connecting parents and children” immediately came into his mind. Unfortunately the project was never realised due to lack of funding, but Moore continued to explore the theme throughout the 1940s. Compositionally works such as this recall Moore’s Shelter Drawings, executed during the war, in which families and friends huddle together in the London Underground. However, the Family Groups mark a change in mood. In this image the father symbolically raises his small child into the air, signifying the nation’s hopes for a new beginning in the war-torn world. 'The Family Group' series also held a deep personal significance for Moore, who was trying with his wife for a family of their own at this time: “The whole family group idea was so close to one as a person; we were just going to have our first child Mary, and it was an obsession”. Throughout the war years Moore focused primarily on drawing. Materials for sculpture became increasingly hard to find but drawing had nevertheless always been an important aspect of his practice. Moore used the medium as a means of looking “more intently and intensely” at the human figure. Moore also referred back to sketches such as this when, in 1947, he was asked to make a sculpture on the family theme for the Barclay Secondary School in Stevenage. In 'Family Group' (1949) he kept his “most important motif” - that of the child wrapped in the arms of his parents. Moore cast 'Family Group' in an edition of 4 + 1. The first cast was allocated to the Barclay School, the second to the Tate Gallery, the third to the Museum of Modern Art in New York, the fourth to Nelson Rockerfeller. A year before his death Moore had an additional cast made which is now in the collection of the Henry Moore Foundation.